Terrorist breaks into home in Halamish during Shabbat dinner, murders three Israelis and wounds a fourth. Three Israelis were murdered on Friday evening in a stabbing attack in the Shomron (Samaria) community of Halamish, located to the north of Ramallah. 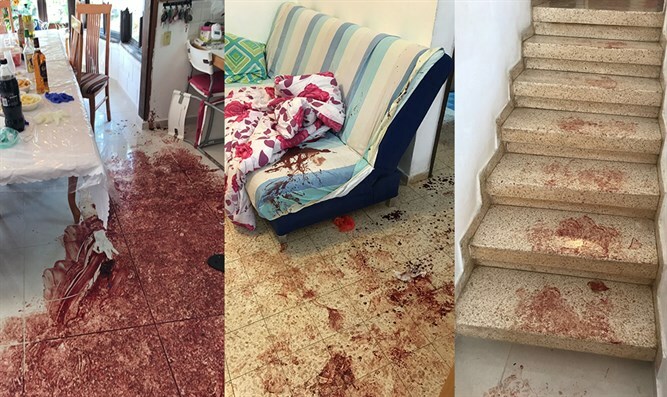 A terrorist broke into a home in the community as the residents were in the middle of their Shabbat dinner, celebrating a Shalom Zachor, the traditional Friday night festive gathering on the birth of a son,, stabbing four people. Two men, one in his 40s and one in his 70s, and a woman in her late 30s, suffered critical injuries and were later pronounced dead. A 68-year-old woman suffered moderate-to-serious injuries in the attack and was evacuated by Magen David Adom paramedics to the Shaare Zedek Hospital in Jerusalem. The wife of the murdered son managed to hide the family's five children, lock the door to the room and call police. The terrorist, identified as 19-year-old Omar al-Abed from the nearby Palestinian Arab village of Kaubar, admitted tha the purchased a knife on Friday with the express purpose of using it to murder Jews, egged on by the incitement from the imams on the Temple Mount. He was shot by a neighbor who serves in an IDF combat unit and was home on leave. The neighbor heard the screams coming from the house, came running with his weapon and shot the terrorist, woundiing him seriously. IDF troops are conducting searches in and around the community and checking whether other terrorists were involved. “Another 60-year-old woman who was conscious and suffered from stab wounds to her upper body was treated at the scene and evacuated to the Shaare Zedek Hospital in moderate-to-serious condition,” he added.